The Club has just learned that Canadian Life Member Mervin ‘Merv’ Therriault passed away last Saturday just over a week after his 88th birthday. An early member of the Sports Car Club of British Columbia, Merv competed with a Jaguar XK120 before travelling to Europe in 1957 to visit the major races the Nurburgring, Le Mans and Aintree. By the end of the year he was broke but was able to use his one year gas welding course at Vancouver Technical College as a basis for persuading Colin Chapman to employee him at Lotus Engineering in Hornsey. 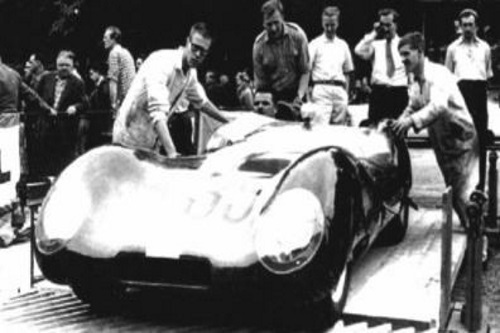 Merv worked on the first Lotus single seater, the Type 12, production Lotus Elevens and the prototype Elite which in turn led him to be taken on as a mechanic with Team Lotus for the 1958 season when it was running the Type 12 in Formula 1 and Formula 2 and the Type 15 in sports car racing including Le Mans. He was also responsible for delivering a Type 12 to Denis Jenkinson on Christmas Day so that Jenks could drive the car on the public highway to fulfil a plan which he had hatched with Colin Chapman earlier in the year. It was in 1958 that Merv became an Associate (Mechanic) Member of the BRDC, proposed by Colin Chapman and seconded jointly by Cliff Allison and Mike Costin. Although Merv returned to Canada shortly afterwards, he never lost touch with the BRDC, making an annual pilgrimage to Silverstone for the British Grand Prix – Members visiting the Campsite will no doubt recall the ageing VW Campervan which served him so well. To Merv’s son Bob and daughter Michelle the BRDC extends its sincere condolences.